What are the recommended remedies for childless couples who are eager? I am very sure and believe that the previous birth sins will follow a person in the next birth. Hence, due to sins committed in the previous births, some of the couples don't have children in this birth. I need to know what they will have to do as a remedy/parigaram as per Hinduism? Its also called like yaagam and homam. My question- What are the recommended remedies for childless couples who are eager? P.S: I am not looking for "please visit the doctor" kind of advice. So, please excuse. The remedy for the couples who doesn't have child is mentioned in Chapter 63 - Of Varaha Purana - PutraPrapti Vrata. This vrata is worshiping Lord Vishnu as Shree Krishna. Here is the entire Vrata with the description of Homa you enquired from varaha Purana. 1 : O king now listen to the brief account of the Putra-Prapti Vrata , I am going to give you. 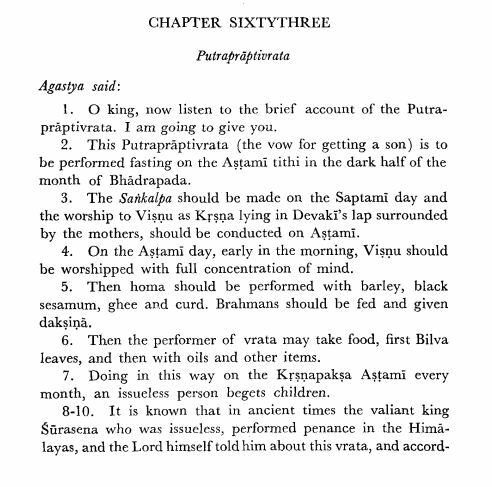 2: This Putra-Prapti Vrata (vow for getting son) is to be performed fasting on the Astami tithi in the dark half of the month of Bhadrapada. 3: The sankalpa should be made on Saptami day and the worship of vishnu as krishna lying in the Devaki's lap surrounded by the mothers should be conducted on Astami. 4: On the Astami Day ,early in the morning ,Vishnu should be worshiped with full concentration of mind. 5: Then Homa should be performed with barley ,black sesamum ghee and curd .Brahmans should be fed and given Dakshina. 6: Then the performer of the Vrata may take food ,first Bilva leaves and then with oils and other items. 7: Doing in this way the KrishnaPaksha Astami every month ,an issueless person begets children. 8-10 : It is known that in the ancient times the valiant king surasena who was issueless ,performed penance in the Himalayas. And Lord himself told him about this vrata and accordingly he performed it and got a son named Vasudeva by name who later on performed many sacrifices and the saintly king surasena gained salvation. 11 :This o king I have told you about Krishnasami (in this vrata) ,at the end of the year ,a pair of cows should be gifted to Brahmin . Such is the Putravrata narrated to you. By performing it one get freed from all sins. Not the answer you're looking for? Browse other questions tagged sin children prayaschitta . What are reasons for Karna's death? Who is the Rishi who cut off his own hands for stealing? What is the prayaschitta (atonement) for a Brahmin for accidentally killing a cat? What is the prayaschitta for chanting the Gayatri Mantra without initiation? What are the guidelines on child adoption? What is the punishment for abusing god? What is shastras recommended way of raising a child? What is the expiation for saying lie(s)?